2014 Road Trip Photos #22: Platter 9 from Outer Space « Midlife Crisis Crossover! Day Five took us to Fargo around lunchtime. Down the street from the Visitors Center was a restaurant that really spoke to us despite their authentic translator problems. 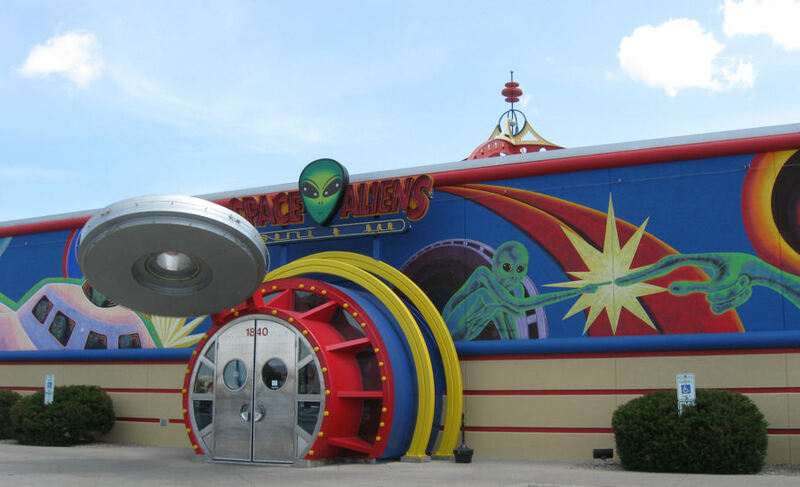 Before we looked it up, we were afraid Space Aliens would be Chuck-E-Cheese with worse pizza. There were games for kids, but we didn’t try the pizza, so we’ll never know for sure. They’re a small independent chain with two other locations in Bismarck and Albertville, MN. 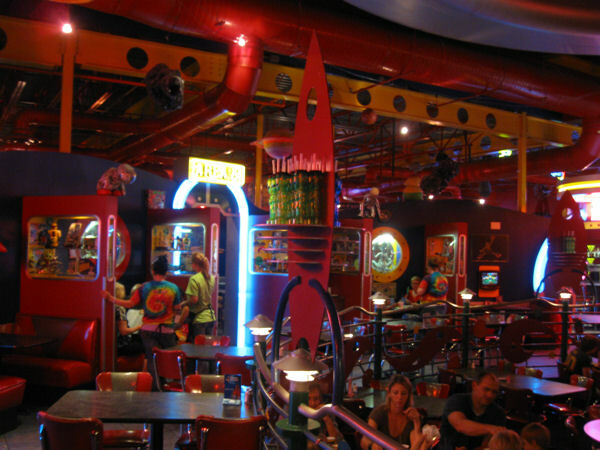 (Their official site lists a fourth location in Waite Park, but it closed at the end of July 2014.) Their theme is…well, duh. You unlock this door with the key of imagination. 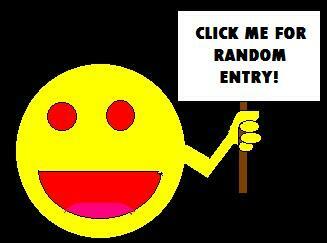 Or try back during business hours. Inside is…well, more bizarre than you’d imagine. For once this tinting isn’t the product of bad camera lighting. 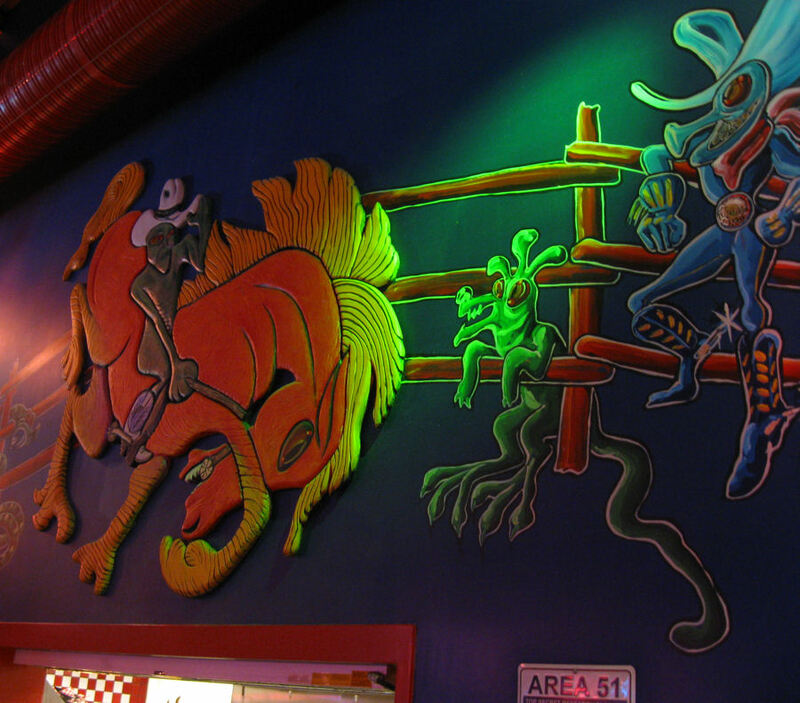 The decor is a combination of art and artifacts. 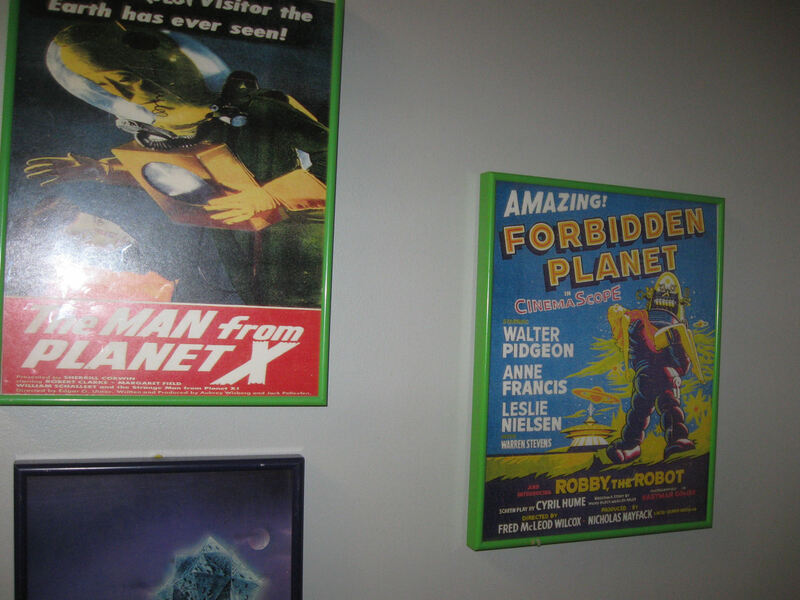 ’50s B-movie connoisseurs can nod knowingly at replicas of classic posters from sci-fi yesteryear. Or, if you prefer, “historical documents”. Genre literature lovers can appreciate that books are included in the mix, quarantined behind glass to prevent contamination. Ancient civilizations referred to the contents of these fragile paper e-readers as “short stories”. Western art lovers who can’t decide whether they prefer cowboys or aliens can have the best of both worlds for reasons beyond me. In an alternate timeline where Cowboys & Aliens really took off, this would be a scene from Daniel Craig’s next sequel. 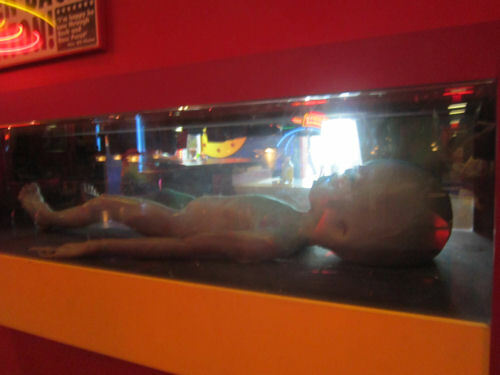 And fans of alien autopsies learn to be careful what they wish for. 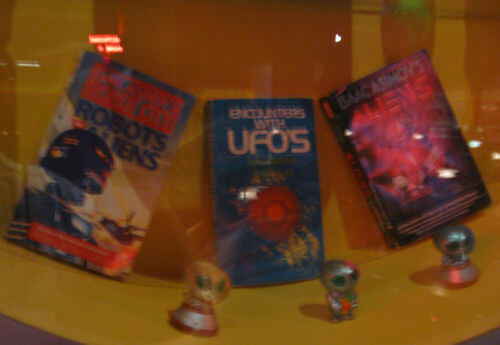 Donation courtesy of Alien Medical School. As for the food: what we had was what it needed to be. 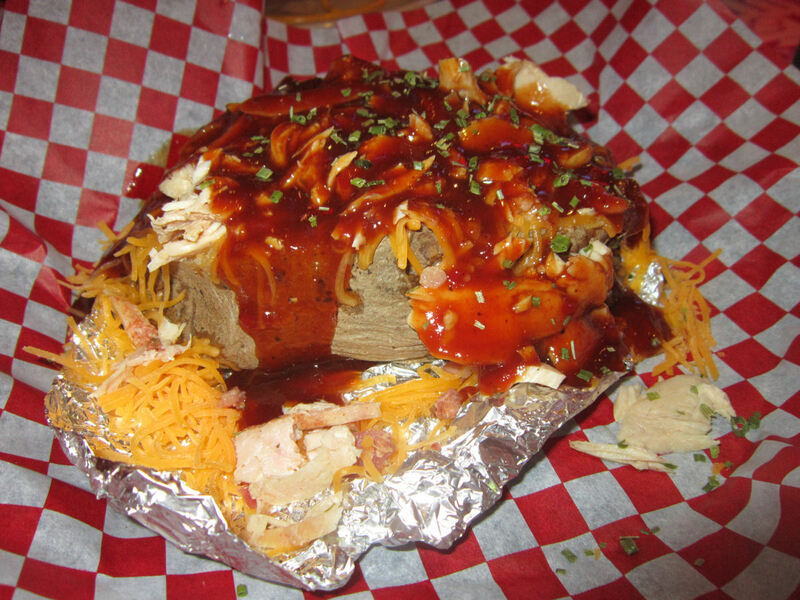 My wife’s BBQ baked potato was the tastier and more outlandish-looking of the two. Call it “The Blob”, maybe. Frequently at restaurants I’ll order something that sounds creative and she’ll order something that sounds closer to ordinary. The dishes will emerge from the kitchen and hers will be twice the size of mine. Such was the case with her loaded space spud compared to my Cuban sandwich. 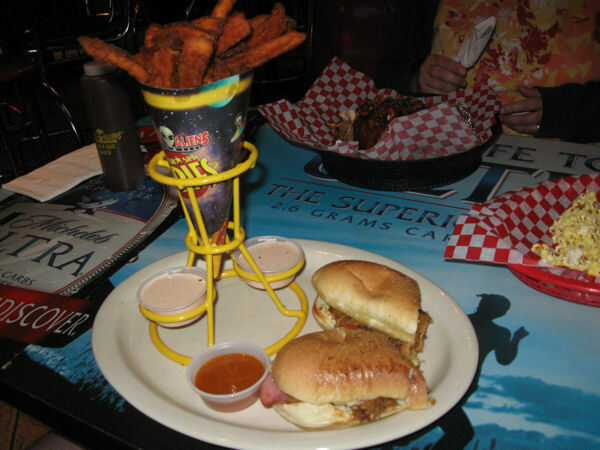 The suspended sweet potato fries, though yummy, didn’t quite balance the scales. I like to think of it as “Pork from Ork”. The captions to each of our meal photos points to my chief problem with their establishment: 90% of their offerings are stuck with boring, non-themed names. 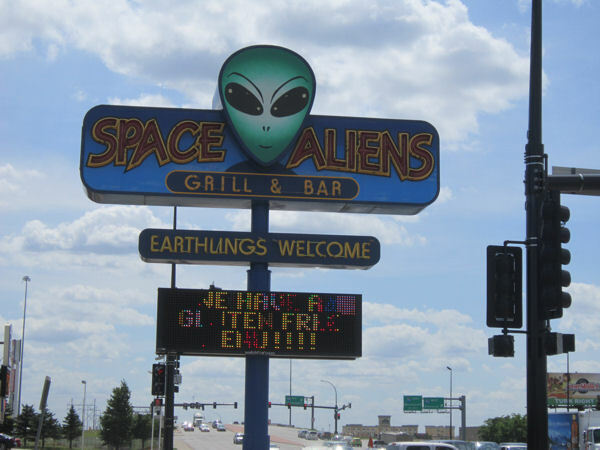 The few exceptions include Martian Munchies (pork strips), Cheddar Cheese Rockets (jalapeno diced potatoes), the Planet of the Zombies Taco Burger, and the Skinny Aliens Veggie Pizza. Otherwise the dish names are interchangeable with those from any given Applebee’s. In a perfect geek restaurant, I shouldn’t have to name my own food. I should be wowed by the chefs’ imaginations, not my own. But hey, themed decor, right? Photo by my wife, because imagine the looks if I stood there snapping pics of the women’s restroom. 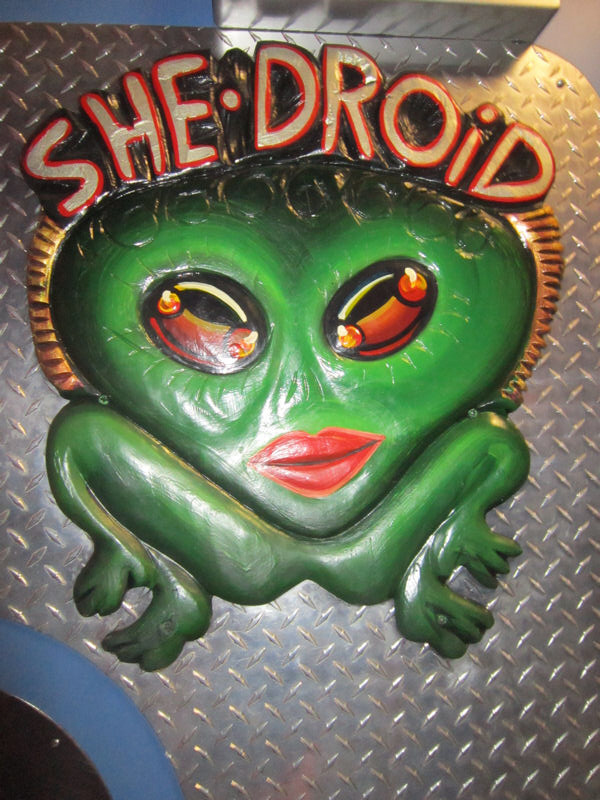 And it’s “She-Droid” because for normal droids, male is of course the default gender. I don’t know whether or not this location is the company’s best, but I’m sure their next one will be even better.